Xavier Thoughts: Now THAT'S A Snake! 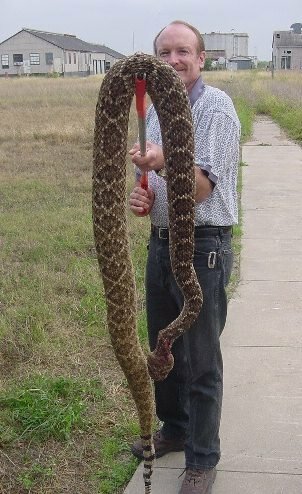 This rattler was killed at the old Turkey Creek gas plant located just South of the Alibates Turnoff on Highway 136, South of Fritch Texas. In a cast iron skillet, fry the bacon. Remove bacon and drain on paper towels. Reserve drippings. Add the oil to the drippings. Flour rattlesnake and fry over medium heat until golden brown. Remove each piece as it becomes done and drain on paper towels. Drain off the oil and drippings reserving 4 tbs. Add 4 tbs of flour. Stir and scrape bottom of the skillet to remove any browned stuck pieces. Add the ham, coffee and milk. Stir until bubbly. If too thick add water, coffee or milk a tablespoon at a time. Serve the rattlesnake with biscuits or toast and the ham gravy. Salt and pepper and/or season with tabasco sauce to taste. Yow! You know, when they took the picture, that snake wasn't completely dead yet. Look at how it's neck is bent and it's head isn't hanging fully limp. I think I would have whacked it a few more times. I did notice that Alan! I bet Buford dropped him shortly after this picture was taken! Creeps me out just looking at it. Glad they don't get that big in my neck of the woods. There's a good reason to keep some snake shot around. According to www.snopes.com, this is a quasi-urban legend. This snake appears to be much larger than it is due to its being held closer to the camera lenses. Ryan, I could not find this photo on snopes. Could you post a URL? Yeah, but 9'1" is still NINE FEET AND ONE INCH! Here's the link from snopes. Oops -- forgot to add the link.